We try to have the kids write their thank you cards within a day or so of receiving a gift. Every day after Christmas they talked about writing them and I hadn't made the thank you cards yet. Of course, I over did Christmas Eve day with all of the baking and wrapping and it took several days of taking it easy for my sciatica to settle down. My son took matters into his own hands. 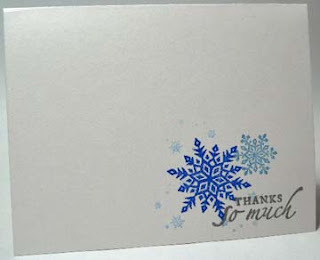 I told of a card I saw on a blog and came up with one version that was close and good but not exactly what I saw. He went back and made the changes and got it looking quite good. He made up enough that everyone could write their thank you notes (even me). Such a good kid. I still have some sciatica issues, still dealing with having a stillborn baby . . . I have kept busy with family, church and PTA/school happenings. Today I told my husband that I will stamp something before I go to bed. It has been so long since I created anything. He said, "Good for you!" and rolled over and went back to sleep. As I sit here, I wonder how long I'll be able to. 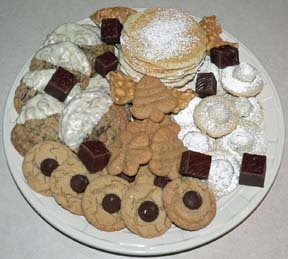 I over did it yesterday making fudge, peanut brittle, pizzelles and 4 types of cookies. I also spent a couple of hours wrapping presents. Still not up to a day like that but I did it. We need to deliver goodies tonight. Still, even with the pain, it feels good to be doing what I normally do. Nothing ever goes right for Eloise. The day she wears her new suede boots, it rains. When the subway stops short, she's the one thrown into some stranger's lap. And she's had her share of misfortune in the way of love. So, after deciding that romantic heroes must be a thing of the past, Eloise is ready for a fresh start. Setting off for England, Eloise is determined to finish her dissertation on two spies, the Scarlet Pimpernel and the Purple Gentian. 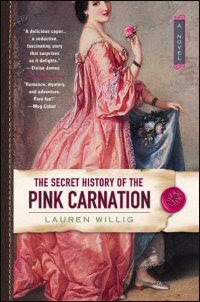 But what she discovers is something historians have missed: the secret history of the Pink Carnation-the most elusive spy of all time. As she works to unmask this obscure spy, Eloise has more and more questions. 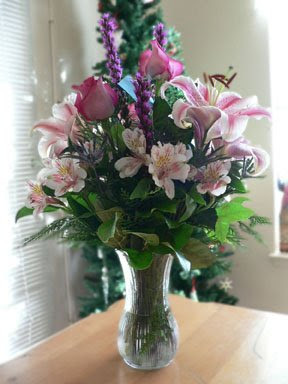 Like, how did the Pink Carnation save England from Napoleon? What became of the Scarlet Pimpernel and the Purple Gentian? And will Eloise Kelly escape her bad luck and find a living, breathing hero of her own? The plans that they had.